If you’ve grown up in the Midwest, then chances are you are familiar with the storm season that can begin in late March and last well up into July. Between the chance of falling trees and flying debris, storms can wreak serious havoc on homes and commercial buildings. But that’s not all. In fact, the biggest threat doesn’t come from the gushing winds or torrential downpours; it comes from the lighting strikes that can end up shorting almost everything you own. In a nutshell, surge protectors are used as a buffering system between your gadgets (e.g. computers) and your electrical system, and are meant to absorb the shock (i.e. surge) of extra electricity that may occur. Simply put, investing in a surge protector helps to ensure that your electronic appliances are guarded from any unwanted electrical spikes in or around your home. When an excessive amount of energy runs through your electric system uncontrolled, it can force too much power into your appliances causing them to short out, damaging them permanently. That kind of damage can end up costing you quite a bit of money. Not only is there the threat of losing a great deal of money. Vital information on your computer can be lost, too. On top of that, there is also the threat of a potential fire that may result in smoldering wires that could go unnoticed and start a fire. Plug-in surge protectors. 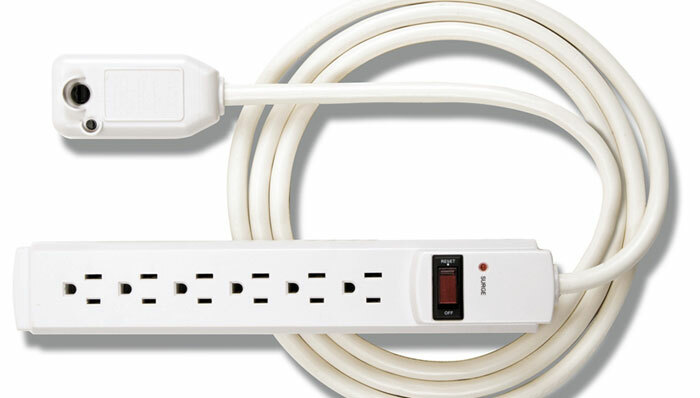 Surge protectors come in many different sizes, the most common being the wall plug-in you can find at many department stores. However, these smaller surge protectors are not the end-all-be-all of surge protection. In fact, many of the surge protectors we purchase at the store aren’t adequately equipped to handle any serious electrical surges that may occur, and will often have to be replaced yearly if not sooner. Whole house surge protector. You might want to consider investing in a whole house surge protector. Whole house surge protectors are hooked up directly to your wiring system. So, rather than stopping the spike right before it reaches your appliances, they are stopping the spike at the source of the power. A whole house surge protector does not necessarily guarantee complete protection from energy spikes which is why we often recommend having individual protectors connected to any appliances you believe need to be especially protected. If you have any questions about the info above, feel free to contact us! Call us today at (402) 339-0524. Hiller Electric can help you with your installation needs. No job is too big or too small, and we guarantee quality service every time!